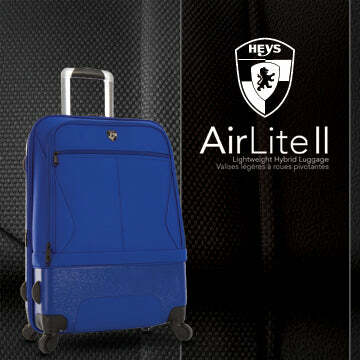 Home / ALL / hybrid-luggage / piggy-back-strap / carry-on / 100-150 / AirLite II 21"
Building on the success of the original AirLite Hybrid Spinners, this new model continues to build on the theory of the best of both worlds - the combination of materials used in the AirLite II® allows it to have the strength and support of a hard-side luggage with the convenience and functionality of a soft-side luggage. Its structural design allows the luggage to be completely frameless, this allows the luggage to be extremely lightweight. The soft-side front panel is made from 1200D Polyester which allows for pockets along the front panel, a feature that is not possible on full hard-side luggage.